Victory smells like evergreen. When you’re searching for the perfect client gift idea, you can avoid sizing issues and peanut allergies when you order Christmas wreaths. Your business associates will be delighted when they receive this classic holiday item. Gorgeous greenery in the middle of December is appreciated no matter where you live, even the classic smell of evergreen brings back happy memories. Corporate giving feels personal when you send a hand-crafted wreath from the artisans at our farm to your clients. We handle the shipping, you receive the kudos! Talk to one of our representatives and we’ll help you through the ordering process. We’ll give you personalized shopping assistance to help you with your order. 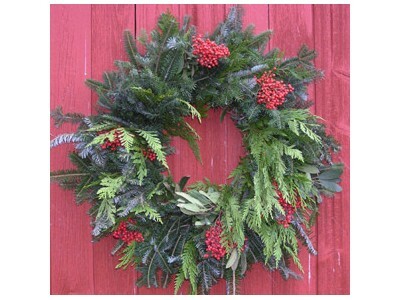 You can send everyone the same gorgeous Fraser Winterberry Christmas Wreath or specialize your order by sending some clients the Christmas Classic and others the Great Lakes Christmas Wreath. Browse through our wreaths to see our different festive options: round vs square, bows and berries, all cedar or mixed greens, our artisans will make your gifts memorable. Let us help you take the stress out of corporate gift giving, so that you can focus on all the reasons you celebrate the holiday season. And every time your clients and business associates see or smell the gift you’ve thoughtfully sent them, they’ll be glad they’re doing business with you. That sounds like a win-win!